I spent 5 months in the USA, and everything went without a problem. Now I'm spending my second month back in my country (the Czech Republic). In a week or two I want to go back to the USA for another 5 months, visiting my girlfriend who is studying there and is a US citizen. Is it a good idea to mention to the immigration officer that I'm visiting my girlfriend, and that's basically my travel plan? I have a regular traveler visa. I was in a similar situation a few years ago. 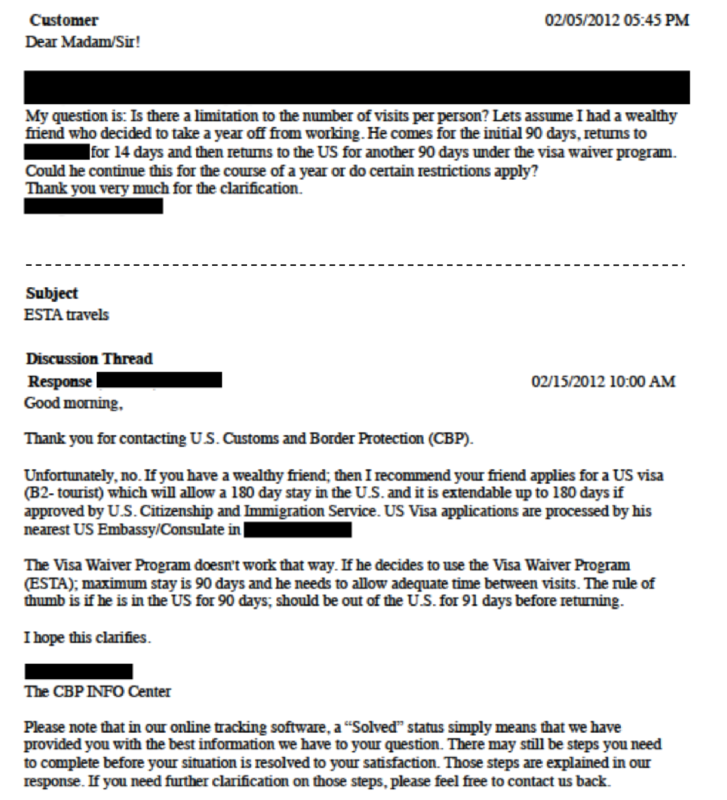 I actually sent an email to US Customs & Border Protection. Their response back then was that they would expect me to be outside of the US for about an equal amount of time to what I had just spent inside before returning. In my case, I had been in the USA with a visa waiver (as a EU citizen) for 82 days (almost the full 90 days). I stayed home for 90 days and returned. I was pulled from the line at the airport immigration before making it to the front. I was taken to a separate room and asked a lot of questions along the lines why I was returning again on a tourist visa, whom I was going to stay with, how I was going to pay for all this, etc. I was allowed to enter the country because I could answer all those questions to their satisfaction. But in this case, immigration was very serious about the matter. All things being equal, no, it's not good idea: people entering to visit girlfriends/fiances/etc for long periods of time are at high risk of overstaying and/or working illegally, and you'll get additional scrutiny. However, it's much worse to lie about why you're visiting, since immigration officers are very good at spotting any inconsistencies in your story and you're basically guaranteed to be denied entry if you're caught. You also will be asked how long you're staying, and when you say "five months", they will ask a) why so long, b) how you're going to support yourself, and c) how do they know you will go back home. So my advice would be to find another reason to go to the US and explain this when asked -- but don't lie, it has to be real. For example, maybe you can enroll in some local training course that will assist you in your career when you get back, and if asked where you're staying, you can state that you're renting a cheap room from/sharing a flat with a "friend" you met in the Czech Republic. (No need to mention that you're romantically involved, unless explicitly asked!) Remember that they will likely know that you've already stayed for five months before, so be sure your explanation covers that and that your girlfriend knows what to say in case they call her. It is neither a good or bad idea, it's your only option because it is the truth. Getting caught on a lie would surely make things worse, so unless you are a conman or a politician, I would not advise testing USCIS officers ability to catch liars -since that's what they do for a living-. Personally, I spent many months (never more than 3 at a time, since that's the limit for the Visa Waiver program) in the US visiting my girlfriend, always said that was the reason for my trip, and never encountered any problem. I would say that it depends with a bias towards to the other answers saying "don't mention anything they don't specifically ask". My wife is from Ireland and came back and forth to the US 3 months on, 3 months off (both the limits of each interval). She did this a few times (maybe 4 or 5) without any problems. However one of those last times, she was taken into a little room and basically harassed about it. They told her that she needed to get her act together, and "you know you can't just get married over there" kind of thing. They let her through, but were very suspect of it and knew that something might have been going on. Long story short, we filed for K1 visa and 13 months later (with no trips by either of us) we got married. It was hard, and the phone bills were huge, but we're still together nearly 11 years later. So, it can work out but you are raising their suspicions that you are trying to "sneak" your way to the US. BTW, if you do decide to get married, DO NOT just get married. Do the visa thing. Do your paperwork, pay your fees and wait in "line". This will save you a lot of headache and a potential multi-DECADE ban from the US and crazy INS vists and just basically government shenanigans. When my wife was in the immigration office in Dublin, she met a couple that just got married willy-nilly thinking it would work. The woman was banned for 10 years. Another newspaper story of nearly the same situation reported a ban of 30 years. US gov't doesn't appreciate you doing things out of order. The problem is your behaviour is going to look suspiscious. What are you going to do during the day? Tourist type activities and dossing around are going to wear thin after a while, and given it doesn't seem you are especially rich, you may get tempted to work illegally. Spending more time in than out without a very good reason looks like migration, not visits. Unlike some places, the USA doesn't have a hard and fast rule on time in versus time out but that doesn't mean you won't get denied if they think you are trying to immigrate. You may very well intend to take a break from study/work for a while and move back to your home country with your girlfriend when she finishes her studies, your family may well be willing to pay for this, but the immigration officer has no way of confirming you or your families' real intentions. Try and keep doing what you are doing, it's not illegal per se (assuming you get the visa, 5 months is too long for a single trip under VWP) but the more times you do it (you don't say how long your girlfriend has left on her course or what her plans are after that) the more risk you run that you will be denied a visa or denied entry. Entering the US for you is a privilege, not a right, which means you have little recourse if they say no. Make short visits making sure you spend more time at home (or at least outside the USA and its immediate neighbours) than in the USA. Maybe have your girlfriend come and visit you instead sometimes or meet up in some third country. Get some other legitimate reason for long trips to the USA. The most obvious would be to start a course of study at a US college/university. Marriage may also be a possibility, but in the short term is likely to make things worse, not better, and should of course only be done if you really believe you will stay with the person for the rest of your life. Using a sham marriage to immigrate is illegal and carries stiff penalties. The ONLY important question here is not being asked yet: What does your visa say? If you have a typical tourist visa, I think it should be 3 months in any 6 month period. If that's the case and you stayed 5 months, that's a problem and it doesn't matter whether you say something about your gf or not. If your visa allows you to spend 5 months, 3 months out and 5 months in the US, then it's not relevant what you say (although I agree it's not a good idea to offer up more information than asked). I came to USA on holiday for 3 months on a visa waiver to visit a friend and do a few road trips but while here her uncle took sick so we did a road trip to see him. On our return to my friends house she received a phone call that her uncle passed away. We drove 13 hours back to attend the funeral. Needless to say I did not get to do my road trips. I returned home to the UK and stayed home a little over 3 months during which time I applied for a 10 year B1/B2 visa.I returned to USA in December last year with the intention of staying six months. I was stopped at the airport by immigration control and accused of living in USA. I was taken into a room and questioned about my visit my ties to the UK and my relationship to the person I was staying with. I answered each question open and honestly and to the best of my ability and was allowed to enter. Since then due to my friends illness and operations and also severe weather during the spring I was still unable to do my road trips so applied for an extension of stay. I asked a law firm to complete my application and stated the above as my reason to request an extension. It was granted. All I can say is if you are honest forthright and do not try to play the system then immigration will treat you fairly I love USA I have many friends here and get invitations regularly but unfortunately I will not return here for at least a year after I land back in the UK. Yes you should say it. I went through this a number of times. Just make sure you say exactly how long you are visiting and bring some evidence (copy of a lease, college id, work contract) that you have a reason to return after your stay. 5 months is longer than the Visa Waiver Program allows (90 days). If you already overstayed this once, then you won't be allowed to enter on the Visa Waiver Program again for a certain period of time. You need to get a visa. VWP - Can I leave the US and go to Paris and return back to the USA? Will traveling to Cuba reset my ESTA?